We interrupt our usually good sewing karma programming to bring you this breaking news. 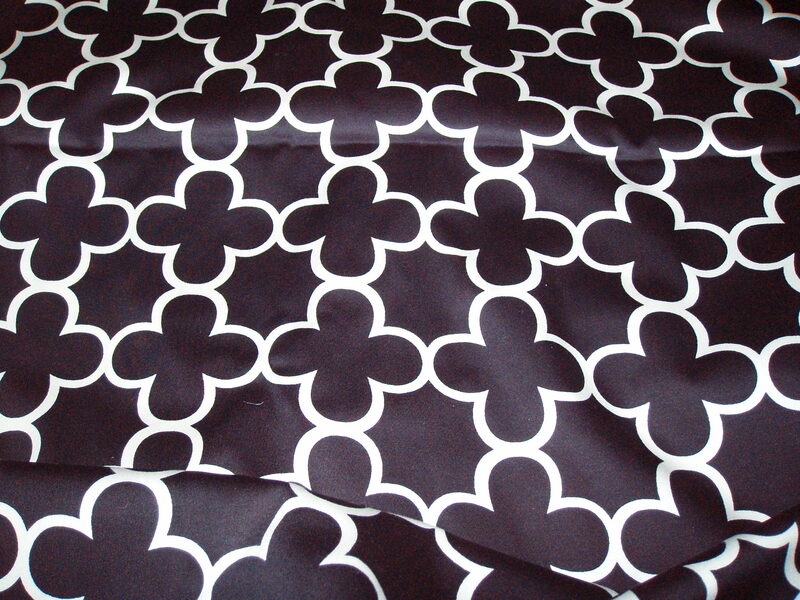 Unbeknownst to Elizabeth, on one of her first fabric shopping excursions, she was sold a stretch cotton in a beautiful black and white alhambra clover pattern and it is OFF GRAIN!!!! I went crazy tonight, trying to match the clovers at the CB seam and couldnt get it to match no matter what I did. I am so disappointed. And to top it all off, in my newbie state I bought way too much of this fabric, like 3 yds. What am I going to do with 3 whole yds of off grain printed fabric??? Please tell me there’s something I can do! PLEASE! This entry was posted in Beginner, Problems, Stash. Bookmark the permalink. I say, cut all your pieces out on a single layer instead of folded and it should work out okay. I hope cutting everything from a single layer works for you. Sorry for the sucky setback. Ohh disappointing. I also say try cutting your patterns pieces on single layers. I do hope it works out for you. Perhaps it’s a good thing you bought 3 yards! I don’t have any new suggestions to add since cutting in a single layer seems to be the way to go but it would be a shame not to be able to use such a beautiful piece of fabric. Thanks for the suggestions. I actually was already cutting in a single layer, but not only is the print off grain but it’s crooked too. Double whammy. How noticeable would it be if you used it for something cut on the bias instead? Maybe the feel of the fabric is too stiff, but you might be able to get away with it then. GO ahead and make it off grain. If anyone asks, tell them it’s a ‘unique design element’. Either that or cut everything on the bias. I like that fabric – where did you get it, and what type of garment are you planning on using it for? It would make nice cushions…. Return it. Their response would determine if I ever went there again. Donate it to the nearest thrift shop! this is the one unrecoverable fault. And in this print it’ll show, really show. Whatever you do, don’t try curtains, they’ll be truly horrible (the Voice of Experience is speaking to you..). Agh, I feel your pain. I have been in your place before. I think in my case the print wasn’t horribly off grain and I wasn’t using a structured pattern so I cut the pieces on a slight bias, matching the grainline to the pattern rather than the grain. But that won’t work in a structured garment! By any chance did you buy this at Metro Textiles? I have had problems there with fabrics printed off-grain. I think I’ve just cursed a lot and then thrown the [expletive] fabric out. I’ve had great luck using fusible interfacing to stabilize knits to sew them into bags or other crafts – you could try that! Or maybe use it to line something else? Another coat? Personally I think you could make that into a cute home apron – a few little skirt-style aprons (Anthropologie makes a KILLING on their simple aprons!) … Maybe one for your sis and Katie, too? I learned how to fix off-grain fabric from one of Cynthia Guffey’s dvds. Open the fabric up and clip through the salvage edge. Grab one of the threads where you clip and carefully pull it (trying not to break the thread). If it breaks (and it usually will), clip carefully along the fabric where the thread is missing until you reach the end of the broken thread. Pull and clip all the way across the fabric (selvage to selvage). Do the same at the other end of the fabric. Now fold the fabric in half lengthwise and smoothing it flat. At this point, you will be able to see how much the fabric is off-grain. If the short side is on the bottom, turn the fabric over. Now grasp the fabric along the fold a few inches down with one hand and follow along the bias (45 degrees) to the cut end of the fabric and pull to stretch the fabric until it lies evenly on top of the cut edge of the lower half of the fabric. Move your hand down a few inches and do the same thing down the length of the fabric (eventually you will be pulling the fold edge and the selvage edge. You may need to do this a few times until the fabric is perfectly square. This is a real pain and can easily eat up a few hours depending on the length of the fabric, but you will be happier with the end result.